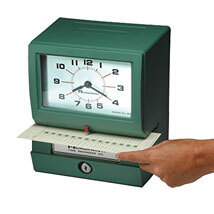 This reliable time recorder can handle thousands of print punches per day. Acroprint Model 150 time clock is suitable for time and attendance tracking, job costing, time and date recording and many other applications. Automatic feature prints time when time cards is inserted. Automatic ribbon feed and reverse ensures long ribbon use and easy replacement. Units are wall, desk and platform mountable and the heavy-duty construction resists rust, corrosion and denting.